Booklet ‘Isle of Tiree: Eilean Thiriodh’ edited by Mona MacDonald, 1973. 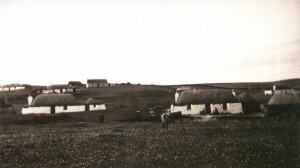 Guide to townships on Tiree, with black and white photographs, local advertising and map. 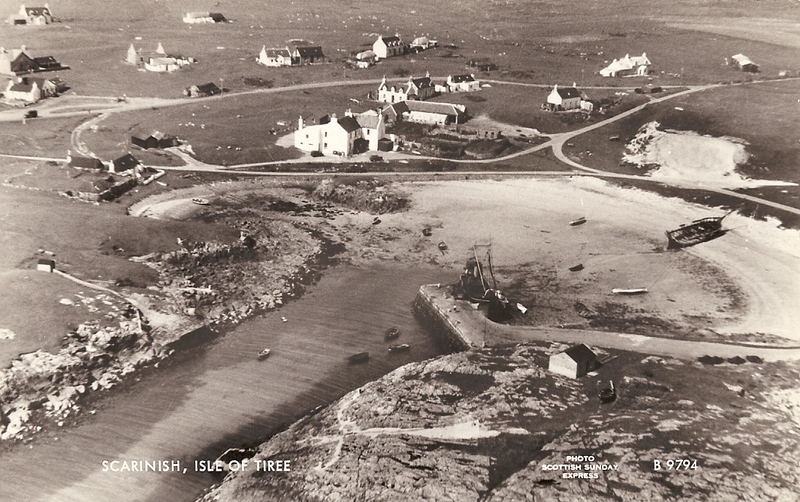 An abridged version of the Tiree section of the ‘Handbook to the Islands of Coll and Tiree’ written by the Rev. Hector Cameron. Signed by Eleanor Miller (Hudson), Taobh-na-Mara, Balemartine, Isle of Tiree. Collection of 15 fragments of pottery found at Salum beach by Charles MacDonell in 2011, including part of the base of a pot and a fragment with hatch markings. Stored in box with 2010.35.1. 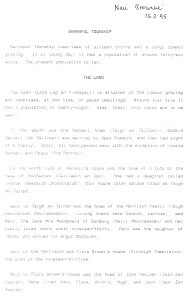 Photocopied extract from an A5-sized book (probably published by Argyll Estate) listing the names and ages of all the inhabitants of land belonging to Argyll Estates in 1779. Found in Flora MacArthur`s house (now demolished) at Sandaig 2010. Information about Iron Age pottery design, markings and uses from a CBA Research Report, including theories about the presence of post-firing drilled holes. Includes printed email from Ian Hewitt regarding holes in Iron Age pottery. Scanned copy of an extract from `Origines Parochiales Scotiae – The Antiquities ecclesiastical and territorial of the parishes of Scotland` for the Parish of Coll, including Gunna. Copy of Ordnance Survey map of Tiree (1:25,000) with township boundaries and compartment numbers hand-drawen in around 1990. On four sheets of A3. Hardback book describing in text and colour photographs the landscape and history of Scotland. Contributions by various authors and photographers including George Blake, WH Murray, JS Grant, Seton Gordon, Tom Weir, John R Allan and Mory McLaren. Tiree on page 101. Black & white photographic postcard of Scarinish and Scarinish harbour from the air during the 1950s.